David Ward appeared at the, Los Angeles Times Festival of Books held at the UCLA campus, Los Angeles, CA. on Sunday, April 26th. He was one of 4 panelists discussing the topic, "History: The Underbelly of California". 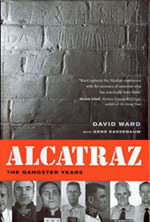 Ward signed copies of his new book; "ALCATRAZ, The Gangster Years". "David Ward's magisterial study of the prison, Alcatraz: The Gangster Years, will appeal to anyone interested in crime and punishment, although, at 616 pages, it's longer than Crime and Punishment. The book is the Peter Jackson film of prison studies. . . . Ward and his longtime collaborator, Gene Kassebaum, have produced a combination oral history, documentary history, and longitudinal study (with a few statistics thrown in) unprecedented in scope and duration. . . . Alcatraz, as David Ward has re-created it, is irresistible to read about. But we should be very wary about projecting any Alcatraz-derived conclusions into the present." 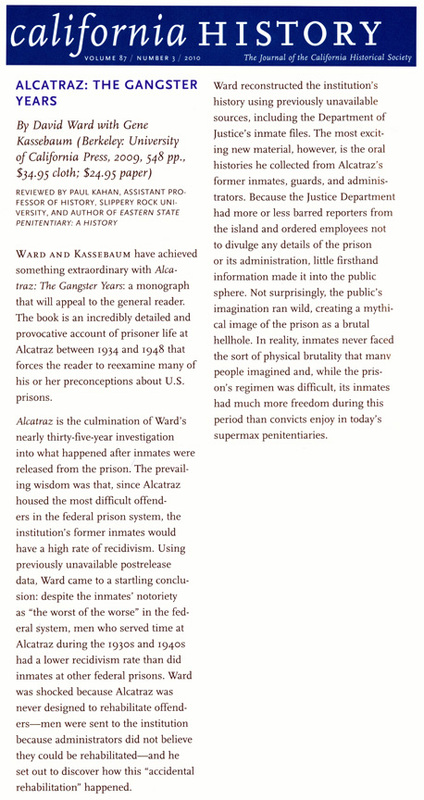 "David Ward's magisterial study of the prison, Alcatraz: The Gangster Years, will appeal to anyone interested in crime and punishment. . . . Ward and his longtime collaborator, Gene Kassebaum, have produced a combination oral history, documentary history, and longitudinal study (with a few statistics thrown in) unprecedented in scope and duration. . . . Alcatraz, as David Ward has re-created it, is irresistible to read about." "In the middle of San Francisco Bay there rises an island that looks like a battleship ... and when it has not been armed as such, first by the Spaniards and then by the United States Army, it has been a prison of one kind or another. First it was a so-called disciplinary barracks for renegade Indian scouts. Then for captured Filipinos. And always for army traitors. The Spanish lieutenant who discovered it in 1775 might well have called it the Alcazar if he had not been struck by clouds of pelicans that floated around it. So he called it after the bird itself - Alcatraz." EARLY ON THE morning of August 19, 1934, a special train-call it the Damned Soul Train-left Atlanta carrying Al Capone and much of America's criminal elite. Among the passenger amenities were free meals, individual seat chains and cages with tommy-gun- toting guards in each car. As the armed locomotive moved west through the searing heat of the Dust Bowl drought, career gangsters, bank robbers and kidnappers mulled over rumors about their destination, a minute craggy island within sight of the Golden Gate Bridge known as Alcatraz. Was this new maximum-security facility, as the press proclaimed, the American Devil's Island, using demonic means to break incorrigibles other prisons couldn't control? For reasons of security and public relations, the Bureau of Prisons hung a nearly impenetrable veil of secrecy around the fog-bound Rock. Throughout its 30- year history and after, this secrecy allowed the legend of an abusive, insanity- producing California Bastille to grow, siring books and films on oppressed birdmen and escapees that were, well, imaginative fiction. notorious prisoners, the Rock was actually deadly boring…. of Alcatraz graduates went on to lead what Ward calls "constructive, law-abiding lives." His goal is to explain this result…. David Ward was interviewed about "ALCATRAZ, The Gangster Years"
on the Pat Morrison show. The subject of the broadcast was,"Public Enemies"
and the role Alcatraz played in dealing with this kind of criminal. Below is the link to a recording of that broadcast. Al Capone visited Tiburon once. He didn't have an opportunity to sightsee or shop or have lunch on Main Street. He was in a Southern Pacific railroad car with barred windows on his way to do hard time on Alcatraz, aka "the Rock." In 1934, the notorious Chicago mobster was shunted through Marin County to avoid the press as he began serving a 10-year federal prison sentence for income tax evasion in America's first supermax prison. They weren't taking any chances with this particular gangster. From Tiburon, his railcar was loaded on a barge and towed by tugboat to Alcatraz. While the new prisoners were being checked in, the warden asked the celebrity gangster his name. Capone told him, "You know who I am. I'm Al Capone." To which the warden replied, "Well, from now on you're Prisoner No. 85." That anecdote is among the stories about "public enemies" like Capone, George "Machine Gun" Kelly, "Birdman" Robert Stroud, Alvin Karpis and Dock Barker that are recounted in engrossing detail in "Alcatraz: the Gangster Years," a compelling new book by Marin author David Ward, written with Gene Kassebaum. mythology surrounding Alcatraz on Capital Public Radio's, "Insight" program. Host, Michael Krasny talked to David Ward about, "Alcatraz: The Gangster Years" . and from callers to the show. convict Morton Sobell about doing time on the "Rock".